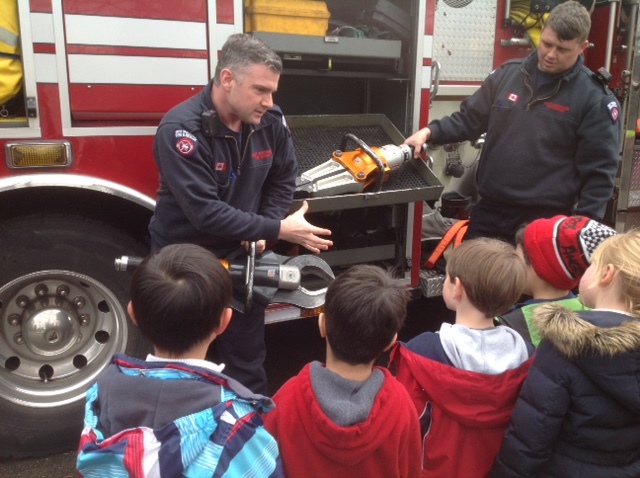 As part of the Kindergarten Social Studies Content, our students are expected to know about “the people, places, and events in the local community, and in local First Peoples Communities,” so meeting with our local firefighters is a tremendous opportunity. In the Kindergarten we consider the firefighters as one of our community helpers, and we want our children to know and become familiar with the roles and responsibilities they fulfill. We welcomed Captain Marcia James (Fire Prevention) and Assistant Chief Jeff Bush (@WestVanFireDept) (Fire Prevention/Investigation) to our classrooms to speak to the Kindergarten. One of the first things we learned is that the Fire Department works in teams, much like we do at school and in our classrooms. Captain James explained that our Principal, Mrs. Brady, is like Chief Randy Heath, Fire Chief of West Vancouver District. In his role, Chief Heath is in charge of the entire District, like Mrs. Brady is in charge of the entire school. Assistant Chief Bush’s role is similar to the teachers’ roles in their classrooms, where we are organizing everyone and letting them know what needs to be done in their working teams. For example, firefighters might go out to help people who are very sick or were in pain. Or people who are walking and hiking may slip and fall: if necessary, the firefighters would come out for those emergencies. The children said they had seen fire trucks where cars had had an accident. But Chief Bush reminded us a fire truck outside a house or building, or at the scene of an accident, doesn’t necessarily mean there is a fire. It might be for some kind of rescue. Firefighters also come into our schools and inspect them every summer. They ensure the sprinklers and smoke detectors are working properly and are not obstructed in any way. Each year our school must have six fire drills so that all of the staff and students know what to do in the event of an emergency. Naturally, the children wanted to know more about what happens when there is a fire. We learned that the first thing firefighters have to do is make sure it is safe to go into the burning building. The air can be very bad, so Assistant Chief Bush donned some of the special equipment the firefighters have to wear. Assistant Chief Bush also spoke to the children through his mask so they could hear what his voice sounded like, and how they didn’t need to be afraid. 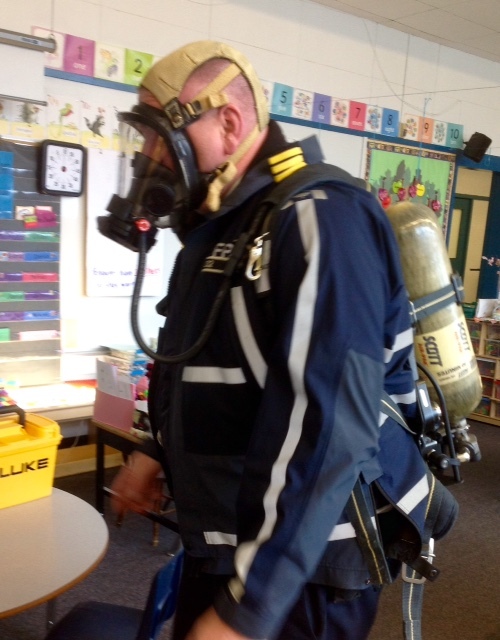 Similar to a scuba diver, our firefighters wear a backpack with an air supply attached to a mask for breathing. We noticed that Assistant Chief Bush was moving and swaying with his equipment on, and that’s because there is a special detector that senses if the firefighter is not moving; it gives a clue that the firefighter may be hurt and signals will come on to indicate something is wrong. Communication can be challenging in a major fire and firefighters have to always be able to communicate with each other. And of course following a fire, another responsibility of firefighters is that they have to go into the building and see how the fire started. “What do you do when the bottles (air supply tanks) are emptying?” A bell rings and you have five minutes before it empties. “How do you open an elevator?” Firefighters have special keys to open it, or special valves to turn to move the elevator car. “If there is a fire, how does the family get out of the building?” Children need to ask their parents, “What is the family escape plan?” Everyone needs to listen to the smoke alarm and make a plan to leave the home and meet in your designated meeting place. Some thought they should hide if there is a fire so it was an opportune time to review what children and adults should and should not do in a fire. It was good reminder for all of us to think about the family escape plan. When a smoke detection device detects smoke, the alarm is sounded so the inhabitants of the building should get out right away. The smoke will be hard to see through, so we’re to get down low to the ground and crawl; air is heavier than smoke so the smoke would be above us. Fires can be noisy and dark so it’s important to yell and shout as we’re making our way out. As well, smoke detection devices need to be tested and checked. October has typically been Fire Prevention month, so checking your smoke and carbon monoxide detectors’ batteries around Thanksgiving would be a wonderful way to show thanks and gratitude for our wonderful families. No firefighter visit is complete without a visit from a fire truck, so you can imagine our children’s delight when this beauty came driving onto the playground! The children suspected something was going to happen as we waited for the playground gate to be unlocked: the fire truck flashed its lights and whistled at us a few times and then the excitement really began! All of children had a turn to climb up into the truck and sit on one of the seats, and some of them also took the opportunity to wear the firefighters’ headsets. We saw the yellow hoses, checked out the water valves, learned about the jaws of life and tested out the weight of a firefighter’s helmet. We engaged in a long discussion about the blocks used to stop the fire truck from moving, or rolling backwards, while the firefighters were working. It was a very wonderful visit! We were particularly pleased to know that our students now have some familiarity with the firefighters, particularly when dressed in their uniforms. We wanted the children to see how firefighters look in their jackets, and with the helmet and shield over their faces. The children need to know not to be afraid or hide from the fire or a firefighter. The firefighters come to help and rescue them. We would like to thank Captain Marcia James and Assistant Chief Jeff Bush so very much for visiting and sharing with us the roles and responsibility of one of our most important community helpers, the firefighter!